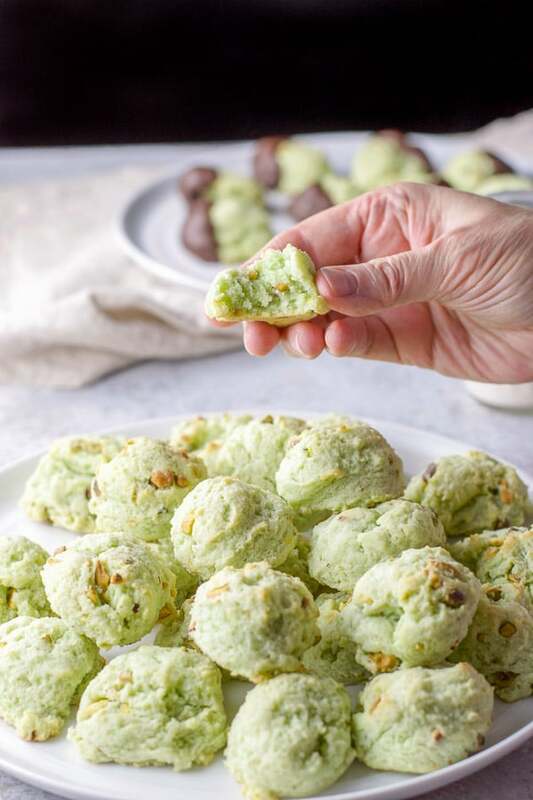 This cream cheese pistachio cookies recipe is one of my most requested cookie recipes. People love them! They are soft, dense and flavorful inside!! That’s what I hear when I bring these cookies anywhere. I’m known in my family for my cookies (that and my cocktails.) So, when people ask what is in them and they inevitably do, I say, “cream cheese.” That explains the texture, along with the subtle taste. There have been times where I’ve made 5 or 6 different types of cookie and brought them to some function, usually around the holidays. I always start making only one kind, then I add another type for variety and it snowballs from there. It’s a sickness, I think. Wait! A variety of yummy cookies? No! Not a sickness: a necessity! 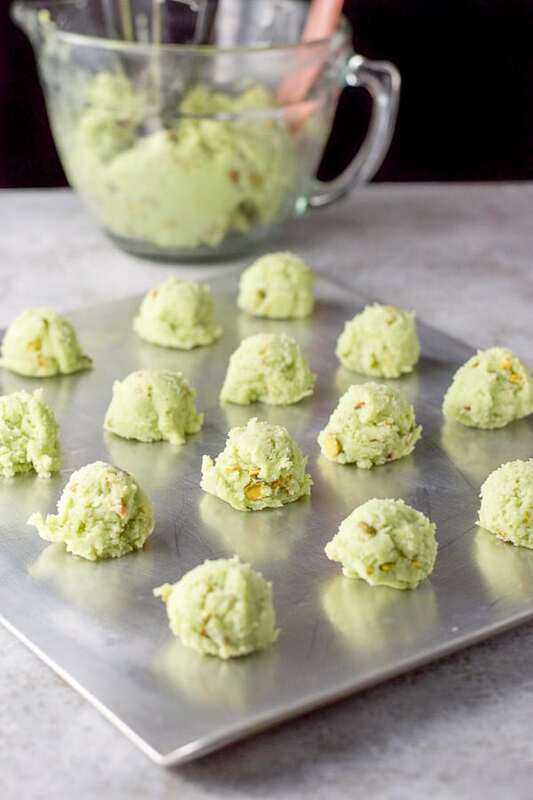 Especially if it includes these moist, flavorful, soft cream cheese pistachio cookies. Take a medium cookie scoop and scoop the batter into balls and place them on cookie sheets (16 balls per sheet). Bake for 15 minutes. They should be a little soft to the touch and slightly browned on the edges. Wait 5 minutes before removing from cookie sheet to a wire rack. Aren’t they so cute? I love these little balls of happiness. This part is optional. Melt 1/2 cup of bittersweet chocolate chips in a microwave. I heat them for 30 seconds at a time, checking and stirring after each round. (It takes my microwave three rounds, or 1 minute 30 seconds, to melt the chocolate completely.) Once melted, dip some of the cookies in the chocolate. If you do decide to dip some cookies, place them on a separate dish and stick them in the freezer for 5 – 10 minutes to set the chocolate. I had to bite the cream cheese pistachio cookie. 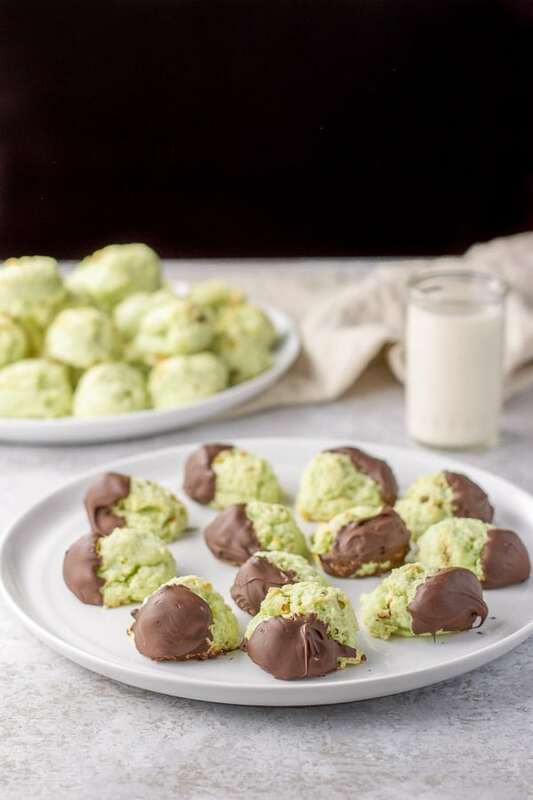 I hope you enjoyed this pistachio cookies recipe! These cookies are the best! Please feel free to leave me a comment. What is your favorite cookie? And as always, may all your dishes be delish! 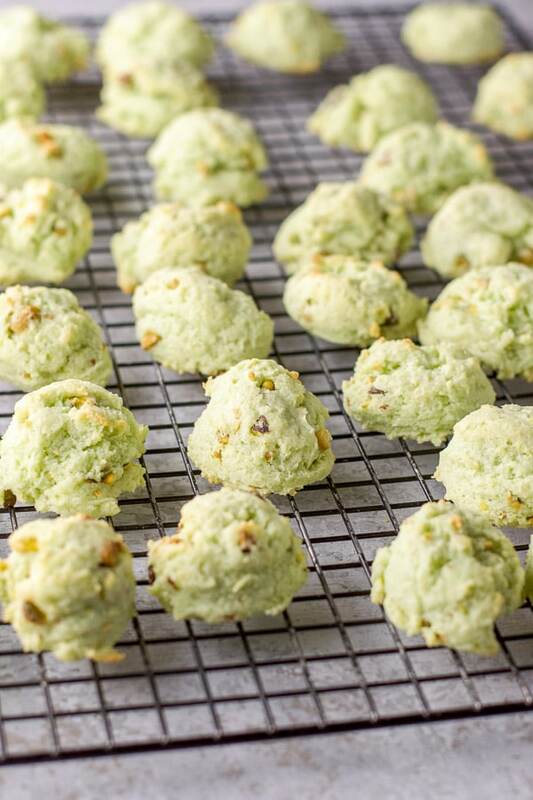 If you’ve tried these pistachio cookies I’d love the hear what you thought about it in the comments below. I love hearing from you! You can also FOLLOW ME on FACEBOOK, TWITTER, INSTAGRAM and PINTEREST to see more of my delicious food and delightful cocktails! These cookies are so soft, moist and delicious cookies! They are my most popular cookie. This post may contain affiliate links, which means I get a small commission, at no additional cost to you, if you click the link and buy. You can read my disclosure here. Liked this recipe? Pin it for later, share it on Facebook, tweet about it and Yum it to Yummly! I greatly appreciate it!! Tag me @dishesdelish!! If you like my recipes! How about following me on Pinterest, Instagram, Twitter and Facebook I would love to connect with you! These cookies are so delicious! And the cream cheese makes their texture wonderfully dense and chewy. They’re the dumpling of cookies! 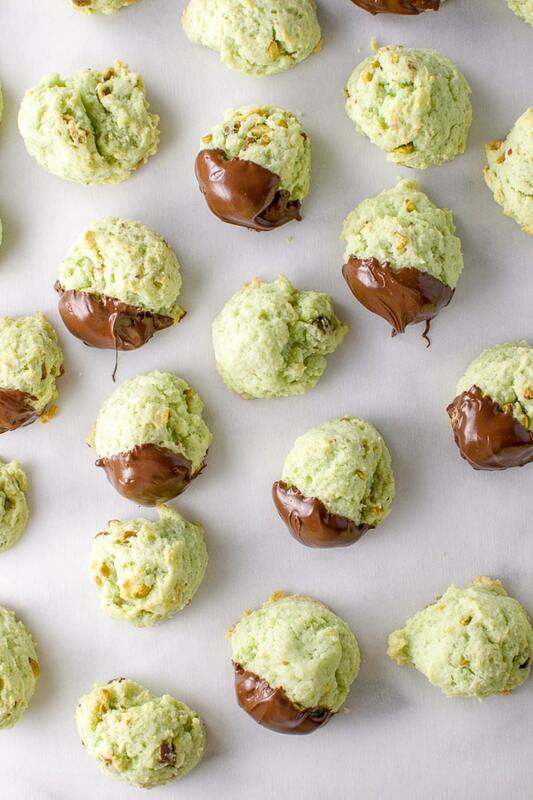 Pistachio is my favorite flavor, and dipped in chocolate! Oh MY! I love pistachio too! And I’m all for the chocolate dipped ones. My hubby prefers the cookies plain. Thank you Krissy! What a wonderful colour. I love anything pistachio at this time of year. Thanks Dannii! Pistachio is a beloved flavor of mine! This is my kind of sweet treat! Your tips are super helpful too! These sound delicious, and such a festive color as well! Thanks Caroline! They truly are a stand out cookie! These cookies are adorable. And I love how easy they are to make. Will definitely give these a try this holiday season. Yay! I bet you’re going to love them Emily! These sound wonderful and such a pretty color. I love that you have both plain and the option to dip in chocolate! That color is prefect for the holidays! Thank you Pam! I appreciate it! Love the colour of these cookies. Pistachios are so delicious. These would look awesome on the holiday treat trays. The guests would gobble these up. 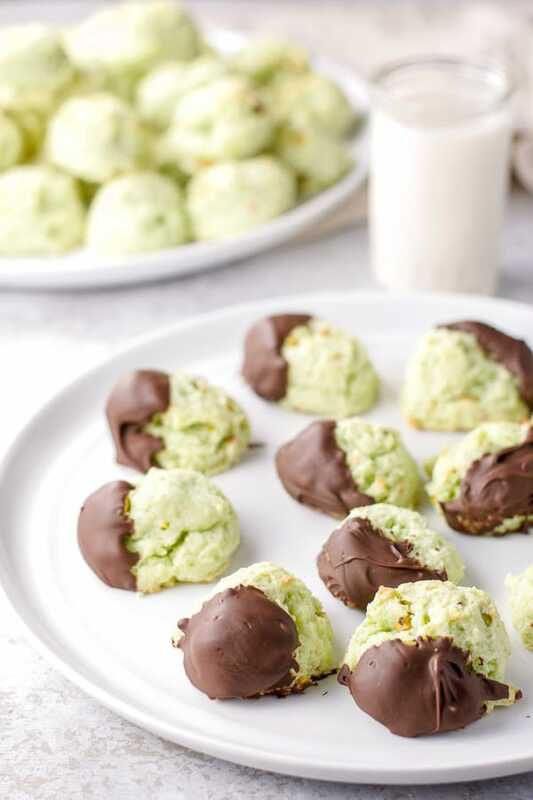 The pastel green of these cookies looks so pretty against the dark chocolate! 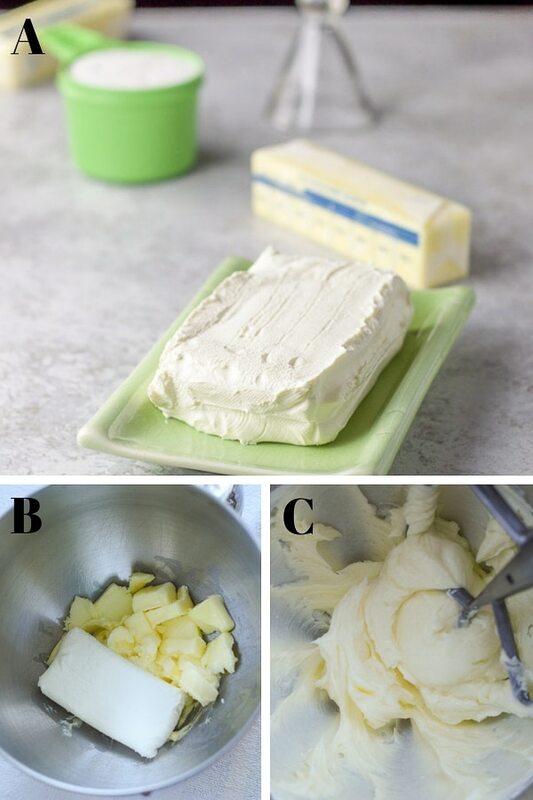 LOVE this recipe and cannot wait to try! They will make a great addition to my cookie platter! Thank you Kiki! These cookies really are a standout and the star of my cookie platter! I hope you enjoy them Veronika. I know I said this in other comments but they really are a standout! LOL Years ago I made cookies with pudding in them. I hadn’t even thought about them for ages! 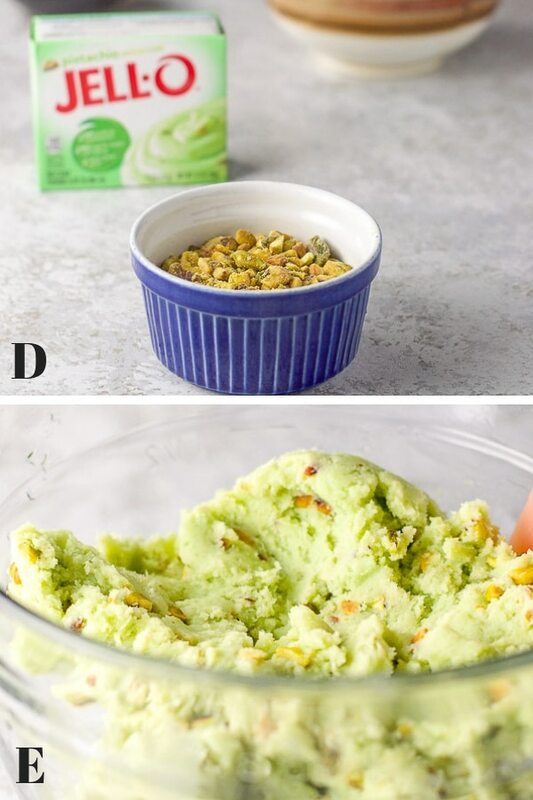 (I don’t bake cookies very often…) Certainly a way to get the pistachio flavor in… And I know the texture is wonderful, between that and the cream cheese! Who would have thought to put cream cheese in a cookie. But it makes perfect sense. I can only imagine the pistachio and cheese combo. Sounds so amazing. Then you take it right over the top with that partial chocolate dip. Mouth watering!😊😁! Thanks, Nicolas! The cream cheese makes them so soft and perfect! Love the color and the sound of these cookies. They are different with the pistachios studding them. I like the touch of chocolate on them. I can see why your family enjoys your cookies and drinks. I’m definitely adding these cookies to my list to make. Love that these cookies are so green! Maybe I’ll try making them look like the Grinch with red chocolate and some sprinkles. Those cookies are gorgeous. Love the subtle green color. Especially the chocolate dipped ones – so good! Where are you finding reg pistachio pudding??? Only have instant here in Mesa AZ. How much of a difference does it make with using the instant? Nancy, I’m sure it’s okay using instant. I just have found (for me) that instant has a slightly different taste to it. But, I’m all for using what you have. I hope you enjoy the recipe! Thank you so much, I will try it and let you know how it works. I will keep an eye out for when I travel to see if I can find it in anther state. Merry Christmas! Merry Christmas to you as well. Wait until your family/friends taste this cookie! You are going to be a rockstar! I don’t think I have ever seen raw pistachios in the grocery store. Are they shelled? How are they packaged and where would I find them? The recipe looks so wonder, and I want to follow it to the “T”! wow This looks and sounds delicious! Thanks for sharing such a great informative post. Hi Linda! Yes, they are perfect frozen. And the fun thing is you don’t have to wait to eat them when you take them out of the freezer! They may be a little harder to bite but they thaw quickly.